Home > News > Southern News > So Long, Smitham! With shifting social patterns in the area, over time the use of the name Smitham for the surrounding area lapsed from common usage and the station is close to the current centre of Coulsdon. The construction and opening in December 2006 of the Coulsdon Relief Road (major route A23) required access routes to the station to be changed, which in 2010 also resulted in construction of new station buildings. 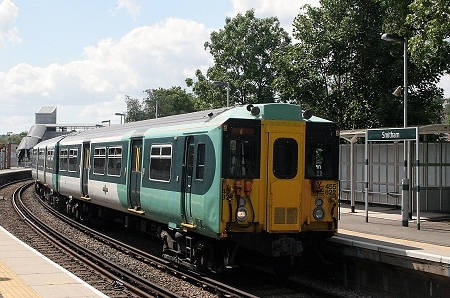 The new 2009 franchise required to consult over the name of the station and following a prime exercise in local democracy the name Coulsdon Town was selected. 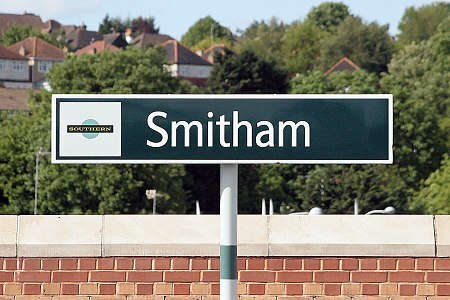 The National Rail three letter abbreviation for Coulsdon Town will be CDN (Smitham = SMI). Ashley Saunders took a trip to Smitham on 10th May to record the soon to disappear name. Soon to be consigned to station sign heaven (collectors and/or metal recycling) a platform sign pictured on 10th May 2011. 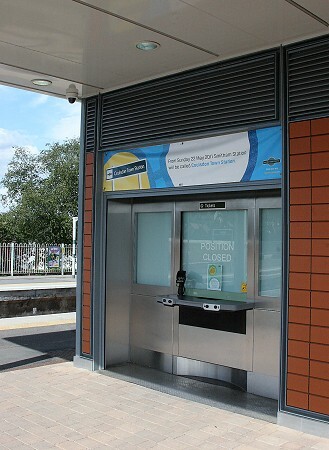 The new booking office surmounted by a sign advising travellers of the name change from Sunday 22nd May. 455822 about to depart with the 14:39 service to London Bridge on 10th May 2011. Some services terminate at Smitham. Note the station is on a sharp curve taking the branch west towards Epsom Downs (the large expanse of open countryside and racecourse, not the station of the same name!). 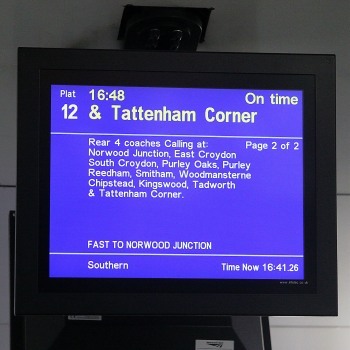 A passenger information display at London Bridge showing a Tattenham Corner service calling at Smitham. At least graphics based electronic displays are easily changed! Now see what happened on 22nd May in our item Come-On-Down Coulsdon Town!